Another factor that is driving the growth of the ERP market is the fact that many manufacturers need to replace existing solutions, either because they use obsolete technology or because of a lack of robust features and functions in their current solutions. Our recent report, The ERP Buyer’s Profile for Growing Companies, shows that the main reasons organizations replace their ERP software are due to bad functionality and outdated technology. The main challenge buyers face when selecting ERP for manufacturing software is that ERP solutions aren’t created equal. There are fundamental differences between various ERP solutions for manufacturers, and one of the most important is the way in which they address industry-specific challenges. Since it’s extremely difficult to create ERP solutions for each industry, vendors have traditionally focused on the two major types of manufacturing: discrete and process. As the name implies, discrete manufacturing refers to the production of distinct or individually separate products. Discrete manufacturers combine raw materials, parts and components to create products that can be sold individually, like computers, furniture, etc. On the other hand, process manufacturing combines raw materials and ingredients to produce batches of finished goods that are either delivered in bulk or sold in different types of packaging, like bottles, cans, barrels, etc. Once discrete manufacturers understand what type of ERP they need, they also need to take into account the main factors that make a discrete manufacturing software a good choice for their company. ERP software has been used by manufacturers for decades, but new technologies, changes in customer behavior and the evolution of the economy are forcing discrete manufacturers to reconsider their priorities. Therefore, manufacturers adopt discrete manufacturing ERP systems to address both traditional and new business challenges. A single source of truth in an ERP database allows manufacturers to better manage different types of information, from customer data to inventory, production and sales or purchasing transactions. It also simplifies searching for information on pretty much anything stored in the ERP database, which in turn simplifies reporting and analytics. An integrated ERP system usually replaces several other tools, point solutions or add-ons, and reduces or eliminates the use of spreadsheets. By adopting an integrated ERP, manufacturers avoid the problems that are caused by the lack of integration between separate solutions and the errors caused by double entry of information. Replacing older technologies such as AS400 systems and accounting tools like QuickBooks is particularly important when manufacturers outgrow the systems they have in place and can no longer manage complex operations. 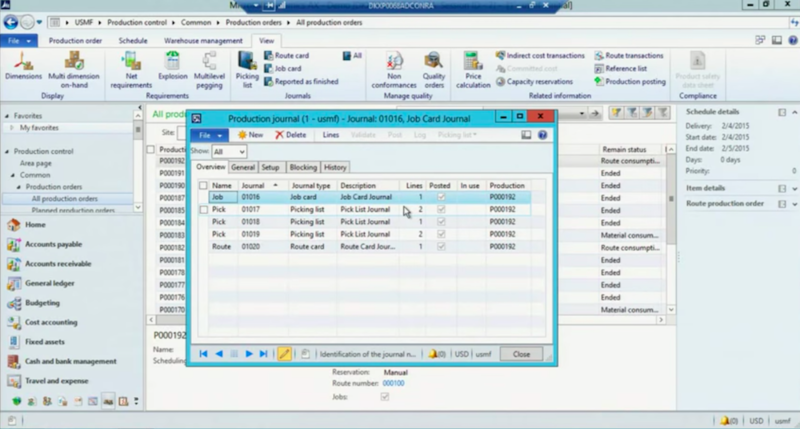 Also, accounting packages usually do not offer features for production management. The functionality for sales, purchasing or inventory are also often too basic for growing manufacturers. ERP for discrete manufacturing can also replace software that’s created in-house, usually by the IT team of the manufacturer or by external IT consultants. While creating one’s own system may have been a good idea decades ago, these days the manufacturers that have built their own solutions are struggling to keep up with the latest technological advancements. Not to mention, these systems need to be constantly patched to stay up and running. Increased productivity gives employees more time to focus on what really matters, instead of focusing on time-consuming activities like data entry. This is particularly important for employees involved in manufacturing operations, where the production output depends on the productivity of the people involved. An increase in productivity can also improve motivation, thus making employees even more efficient. Another important factor that negatively impacts productivity is the fact that users are prone to errors when they don’t have the right tools or easy access to the information required to do their jobs. Manufacturers have tried to address this challenge by using workarounds and by relying on spreadsheets, but this often ends up generating new errors in the long term. To break this vicious cycle, manufacturers can use ERP solutions that offer all or most of the features they need, such as a single data repository. Managing production across multiple locations can be a major challenge nowadays, even for small manufacturers. Many manufacturers use separate solutions in each location as a result of mergers and acquisitions or inconsistent IT strategies. An integrated ERP solution that can be used at any location allows manufacturers to improve information sharing and collaboration among all of their teams, regardless of their geographical presence. A discrete ERP solution that can be used by multiple locations also allows manufacturers to improve the management of resources or equipment. For instance, raw materials can be transferred from a location with a surplus to another location without enough resources to meet its needs. Also, different production operations can be performed in multiple locations during the same production cycle. Reducing costs and increasing profitability are two ways an ERP system can help manufacturers achieve better ROI over time, even though an ERP is a big investment. As employees become more productive and production costs decrease, the overall profitability of the company improves. Manufacturers can also use ERP to reduce back office costs by reducing user errors and the time employees spend on the most common tedious tasks. Another factor that can impact profitability is the business lost by the manufacturer to its competitors. Oftentimes, manufacturers lose important clients or contracts because they cannot comply with the timeline or the quality standards requested by the customer. This can be caused not only by a lack of production capacity or expertise, but also by the fact that the manufacturer cannot plan and execute well enough to satisfy its customers. Since selecting and implementing ERP is a costly and disruptive process, manufacturers should make sure the system will be in use for at least five to 10 years. This means they need to select an ERP solution that will adapt to their changing needs as they grow. A sufficiently flexible ERP solution should allow discrete manufacturers to start with the features they need most and add new functionality as it becomes necessary for the company. Adapting to a changing market requires a lot of time and effort from manufacturers due to the complexity of their operations. For example, when one or more of the products they offer becomes obsolete, manufacturers need to offer new goods. This process involves creating new designs, finding suppliers for new components, estimating which customers may be interested and reviewing the setup of production lines. ERP software for discrete manufacturing easily supports all these activities. An ERP software system can quickly provide relevant information, track operations and costs, and provide insights into effectiveness of business decisions. Benefits from new technology like cloud or mobile-only deployments come with software that keeps pace with the ever-changing world of technology. For instance, except for very large companies, manufacturers cannot generally afford to build and manage data centers to store their data in the cloud. The cloud allows manufacturers to pass on some of their responsibilities regarding data security and privacy. By using cloud ERP, manufacturers don’t need to worry about data backups or upgrades, as these services are managed by the ERP vendor. In addition, more advanced technologies like the Internet of Things (IoT) and artificial intelligence (AI) can only be provided by vendors. These features require major investments and are too complex to be managed by your in-house IT team. Improving relationships with suppliers is critical for discrete manufacturers. Since they generally cannot manufacture all the raw materials, parts and components needed for production, they need to buy them. The main challenge manufacturers face when working with suppliers is they cannot control the quality of the products. Another important challenge is the globalization of the economy, which allows suppliers to manufacture anywhere in the world, but can also create logistics problems. This is why manufacturers need an ERP system to track supplier history, evaluate suppliers based on performance and choose the best supplier for your various needs. ERP can therefore help manufacturers improve their supply chains, which in turn has a positive impact on the customer experience. Quality is not only a legal requirement, but it’s also a competitive advantage. The most successful manufacturers are the ones that push their quality management efforts beyond what the regulations require. There are also contractual terms related to quality that manufacturers need to comply with. All these can have an important impact on the customer experience, but are too complex to be managed using disparate systems or basic software. Only an ERP solution can help manufacturers define, implement and monitor quality management initiatives at all stages of the product lifecycle, from design to the end of life. Manage production with Aptean ERP. Aptean was created in 2012 as a result of a merger between two ERP software vendors, Consona and CDC Software. The company inherited multiple ERP solutions from each of the two providers, which explains why their offering for discrete manufacturers includes eight solutions. Each one of the ERP solutions offered by Aptean for discrete manufacturers has a specific focus: Made2Manage for mixed-mode manufacturing, Intuitive ERP for mid-sized companies, Compiere for the cloud and Cimnet ERP for the printed circuit board industry. 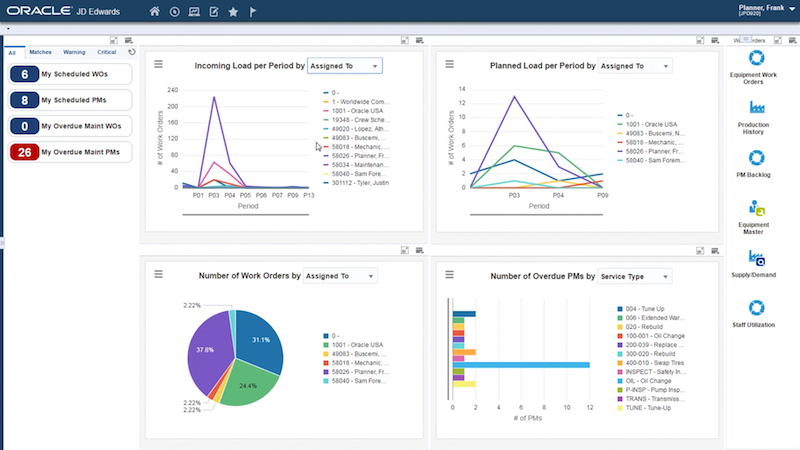 Epicor ERP has a straightforward interface for fast insights. Epicor offers multiple ERP solutions, but the main solution for discrete manufacturers is Epicor ERP. Besides core features like sales management, financial management and production management, Epicor ERP also includes modules that aren’t usually included in other ERP solutions, such as human capital management (HCM), supply chain management (SCM) and service management. While sold separately, Epicor’s manufacturing execution system (MES), Mattec, complements the company’s ERP offering by helping manufacturers better manage production and quality. Epicor ERP is a modular solution, which means customers can choose to add or remove some modules. It can also be combined with other Epicor products like Mattec. As you can probably guess, customization of an ERP package can be a benefit for manufacturers that don’t want to overspend on unnecessary features. IFS has one of the best ERP interfaces on the market, making it a pleasing user experience. IFS Applications is a complete ERP solution for medium- and large-sized manufacturers. The solution focuses on advanced industries such as aerospace, defense, high tech and industrial manufacturing. IFS recently invested a lot in field service technology, which can be very useful for manufacturers that need to maintain or repair the products they deliver. IFS also offers separate supplementary solutions for advanced maintenance management and supply chain management. When combined together, all these solutions can be very beneficial for manufacturers, but it may also require a significant investment. 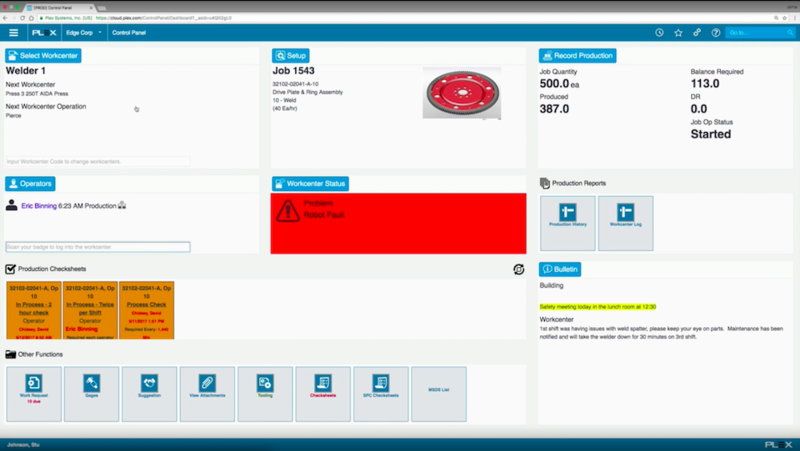 Follow up with production and job orders right on your dashboard with Infor. Infor has acquired a multitude of products throughout its history, and many of them are ERP solutions for different industries. This vendor’s ERP offering for manufacturing includes several products for discrete manufacturing, such as Infor LN for medium to large manufacturers with complex operations and Infor CloudSuite Industrial (previously SyteLine) for small to medium business (SMB) manufacturers. Infor also has a cloud offering of multiple ERP solutions grouped under the name Infor Industry CloudSuite. Each one of these solutions focuses on a different manufacturing sector, such as automotive, aerospace, defense and industrial machinery. Besides core ERP functionality like financials, purchasing and production management, these solutions include different levels of support for other features. This includes customer relationship management (CRM), business intelligence (BI) and SCM. ERP buyers need to make sure they understand what is included in the combination they choose to ensure it covers their needs. Microsoft Dynamics AX allows users to control their operations on a granular level. The Microsoft Dynamics family of products includes four ERP solutions, but only three of them address discrete manufacturing challenges: Microsoft AX, GP and NAV. GP and NAV are the best options for SMB manufacturers, while AX focuses on medium and large manufacturing companies. Microsoft is trying to combine its ERP solutions with newer technologies such as AI and IoT. While these advanced technologies may be beneficial for large manufacturers, SMB companies should be careful not to overspend on shiny new features they may not need. Oracle JD Edwards EnterpriseOne is one of Oracle’s most matured solutions. Oracle is the second-largest ERP vendor, with an annual revenue of $37.7 billion. Its main offerings for discrete manufacturers includes JD Edwards and E-Business Suite. After the acquisition of NetSuite in 2016, Oracle now offers a cloud-native ERP solution for discrete manufacturing. Oracle also recently created its own cloud family of products, which includes a manufacturing edition. ERP buyers should be cautious when considering Oracle ERP solutions because the native cloud offering isn’t very mature yet, while the most mature solutions (JD Edwards and E-Business Suite) weren’t designed for the cloud (even though they are delivered both on-premise and on the cloud). Also, Oracle provides multiple other solutions for all business areas, like HCM, project management, product lifecycle management (PLM) and more, which integrate with ERP. Buyers need to understand how all of these products work together, and how much it costs to implement and maintain any combination between ERP and other types of software provided by Oracle. 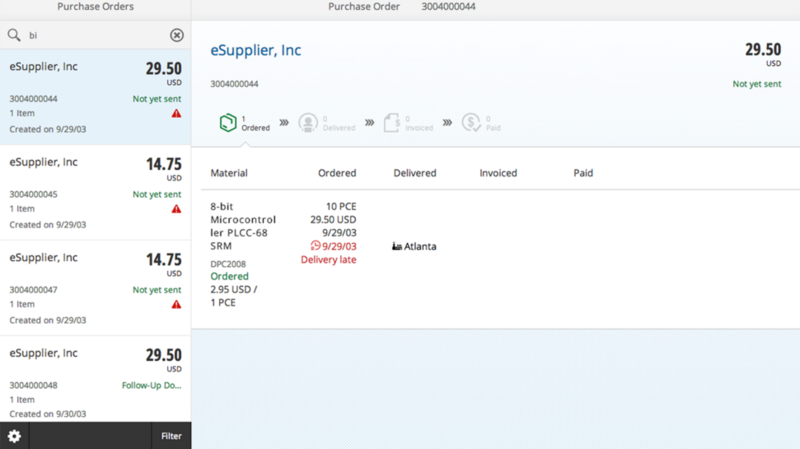 Sage ERP offers insights via a configurable dashboard. Mostly known for its accounting software, Sage also offers multiple ERP solutions for manufacturers of all sizes. For SMB manufacturers, Sage offers the following products: Sage 100 Cloud, Sage 300 Cloud and Sage 500. Sage X3 is the only ERP solution available for medium to large manufacturers. SMB manufacturers should carefully evaluate Sage ERP solutions for their company, as there may be some overlap in functionality and some solutions may not provide enough features. At the same time, others may include too much functionality for an SMB manufacturer. Manage your purchase orders for streamlined production. SAP has the highest ERP market share — seven percent — almost double that of Oracle. Its ERP products are known as being robust but not always flexible, especially its main solution for large manufacturers, SAP ERP. The vendor also offers several ERP solutions for SMBs: SAP Business One and SAP S/4 HANA. The release of the SAP HANA in-memory database in 2010 represented a major improvement to its ERP offering. HANA makes data processing faster and analysis more accurate. SAP offers dozens of other solutions covering various disciplines and technologies, such as marketing, procurement, analytics, human resources and IoT functionality. Most of these options can be combined with ERP solutions to deliver custom packages. However, these packages aren’t always easy for buyers to understand when it comes to details like licensing and pricing. The Plex Manufacturing Cloud has been a leader among cloud-based ERP for discrete manufacturing for years. 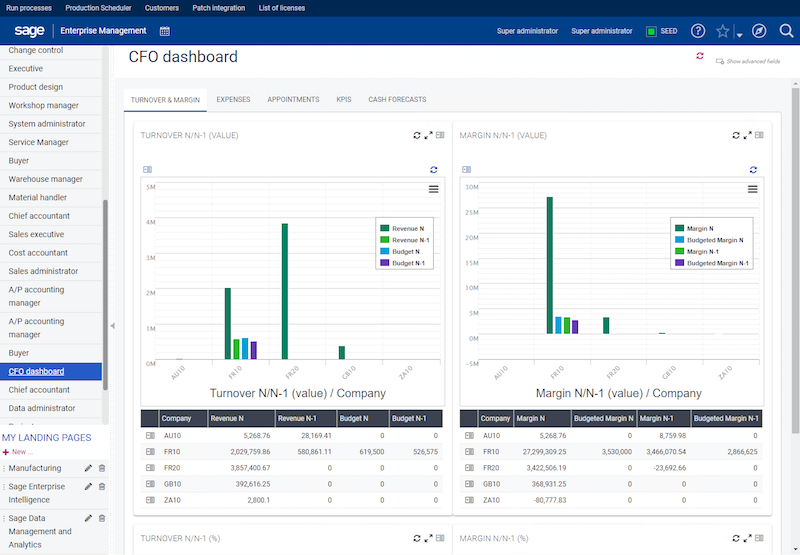 Although this solution provides capabilities related to accounting, sales, HR, procurement and other areas of business management, it was built with manufacturing as the main focus. Plex allows users to track all activities related to production including planning, inventory and quality management. As a tool focused so heavily on manufacturing, it’s not surprising that Plex also contains plenty of functionality specifically dedicated to discrete manufacturing. Lean production practices, quality documentation tools, shop floor integration and many other features are what makes Plex a solid choice for discrete manufacturers. However, Plex users often complain about the displeasing interface and the system’s learning curve. Discrete manufacturers have many choices when it comes to ERP package selection. Aside from the solutions mentioned above, there are dozens of ERP solutions for discrete manufacturing. Some are more generic, while others are more specialized or focus exclusively on one or a few industries. Buyers need to carefully evaluate these options to find the right one for their needs. In addition to reviewing the information above, buyers need to compare how well ERP providers perform when it comes to their other important business requirements. For information on how well top vendors provide features like accounting, HR management, customer management and more, we suggest taking a look at our in-depth ERP comparison report. Once you do, you’ll be able to properly evaluate these options and choose the discrete ERP solution that’s right for you.